And it's incredibly easy to use. Applied in a flash with its precision tip, its ultra-glide, non-sticky texture dries instantly. It-Line also rinses off just as easily with warm water or makeup remover. It-Black, It-Blue, It-Pink and It-Purple for daring combinations and layering effects to create bold makeup contrasts. 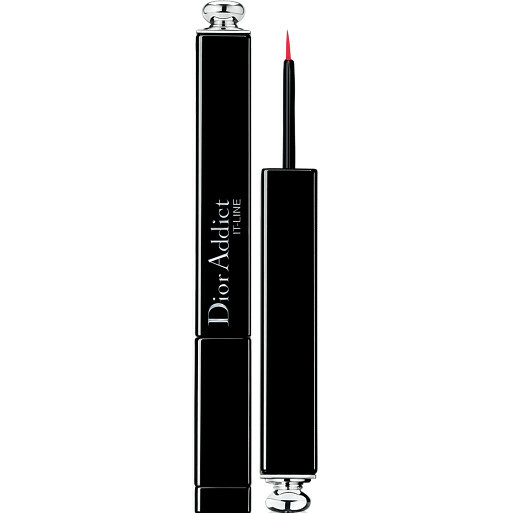 DIOR Addict It-Line Liquid Eyeliner, Fabulous Line and Vibrant Colour is rated 3.5 out of 5 by 2. Rated 3 out of 5 by Sweet666 from Wont buy again! I use and prefer a lot of the quality brands (Chanel/Dior/Shiseido etc) and I already have Dior Addict Mascara and lipsticks which I love. I was therefore really disappointed with this product. The first thing was that the top forms 3/4 of the product. The liner is contained in the small bit at the bottom. I very nearly tipped it all out thinking that the top/bottle were the other way around. I found it difficult to apply compared with other products on the market as you cant control the liquid coming down the brush as you can with a pump dispenser and it is no where near as durable as my Shiseido fineliner. I am continuing to use it because it was not cheap and does the job (when you can get it in a straight line without blobbing), but I will not be buying it again, The only reason I tried it was because Shiseido fineliner was not in stock at the time of ordering and I am happy with all of my other Dior Addict purchases - The Addict It-Lash Black Mascara is lovely. Rated 4 out of 5 by Coraire from Not quite as good as I expected I couldn't decide between 3 or 4 stars for this, so I'm calling it a 3.5 star review. But before I start I just want to say that I love Dior and I think the main reason I'm a bit disappointed and being overly critical is just that I've loved so many Dior products that I have very high expectations from them. I was incredibly excited when these were released, I love liquid liner with a brush type applicator and I have a weak spot for coloured liners, especially purple. So I bought this in It-Purple pretty much straight away. The packaging is stunning as you'd expect from Dior and I hadn't actually realised when purchasing but these are actually 2.5ml compared to my favourite liquid liners which are only 1.7ml. So while these liners are still expensive, at least you know you're getting a bit more for your money. The consistency isn't quite what I expected. Definitely thicker than I'm used to and just less liquidy than I expected. Because of this though the colour when applied does seem a lot creamier and I find it doesn't bleed in to fine lines as a liquid can do sometimes. However the thicker formula does make it a tiny bit harder to apply. Nothing dramatic, but it doesn't quite have the ease of application I usually have from brush liquid liners. Another I like about this is that it doesn't rely on shimmer, it doesn't change to a more vibrant colour when the light hits it, it really is just stunning shade of purple no matter what. However my main issue with this liner is the wear time. I just feel like it doesn't have the longevity that other cheaper alternatives do and while it doesn't really fade the line will often look less neat as the day goes on and I've occasionally had little pieces flake off. The staying time isn't bad and it'll still be there at the end of the day, but it just won't look as flawless as it did at the start and while I know plenty of eyeliners don't, there are still some out there that cost less and won't budge at all during the day. So while it has a couple of faults they aren't anything major and if this were a cheaper liner I'd be more than thrilled with it, I was just hoping I wouldn't have any issues. I won't be desperate to grab it in another colour and I'd rather try some different brands for now, but they are still something I'd consider in future and if I finish this one I'd almost definitely repurchase.